GODERICH – Shawn and Trish Drennan got some vocal support before heading into the Huron County Courthouse for another round of a legal battle against a proposed wind farm in their home community. 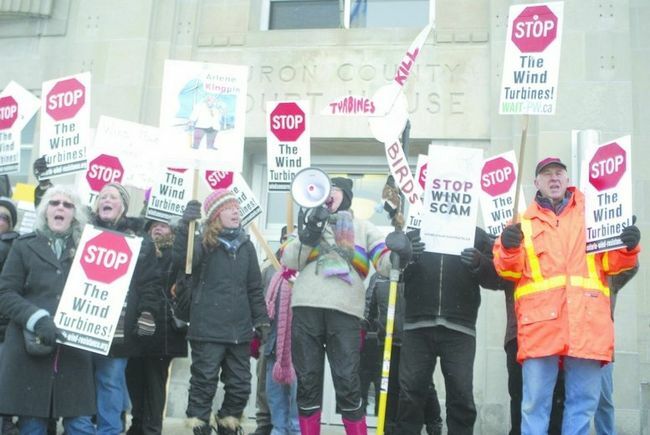 About 75 protestors gathered outside the Huron County Courthouse early Friday to voice their opposition to wind turbines. The Drennans are fighting the proposed K2 Wind project, which could see upwards of 140 turbines erected in Ashfield-Colborne-Wawanosh Township. It’s a provincewide issue. Posted on March 11, 2013, in Ethics, Government, London Free Press, Samsung, Take Action, Take it to court. Bookmark the permalink. Leave a comment.